In this tight economy, many are looking for creative ways to tighten their wallets and colleges are no exception. Many colleges and universities are undergoing budget cuts, and in many instances this means a significant decrease in many departments, often including student activities and residential life programs. What can a Residential Life program do to cut costs and increase efficiency within the department? I determined that, in a budget cut, it is important to maintain a positive morale among employees and to use the changes as an opportunity to revisit, reevaluate, and restructure the mission of the department, finding new and creative ways to meet its fundamental goals. Here, I will explore the ways in which the employees, practices, and procedures of a Residence Life program can increase their effectiveness while also decreasing their costs. a) Begin the conversation with employees by explaining that the institution has had to reduce the funds in many departments (if that is, indeed, the case). Make it clear that the reduction in funds to their department were not unique, but spread across the institution. b) Explain that this change in budget is a good opportunity to review and re-organize aspects of the department, trimming less-successful programs and making the department run more smoothly and efficiently. c) Perhaps most importantly, open up an opportunity for the staff to contribute their ideas regarding what changes they believe will help the department. Specifically, prompt employees to address which department practices and programs should remain as close to their current state as possible, which are more expendable, and which can be changed to cost the department less. This might be done by providing employees with a paper or online survey with open ended questions. Allowing the employees to contribute to this process will allow them to feel less powerless and will allow supervisors to gain valuable feedback from the individuals who may know more about the operations of the department than their supervisors (e.g., in regards to which programs are working, which are less useful, and how to change those than can be improved). Every academic year, the needs of a college or university change, and in response the needs addressed by a Residence Life department change as well. When funds to the department have been significantly reduced, it is important to define the most important, fundamental goals of the department. 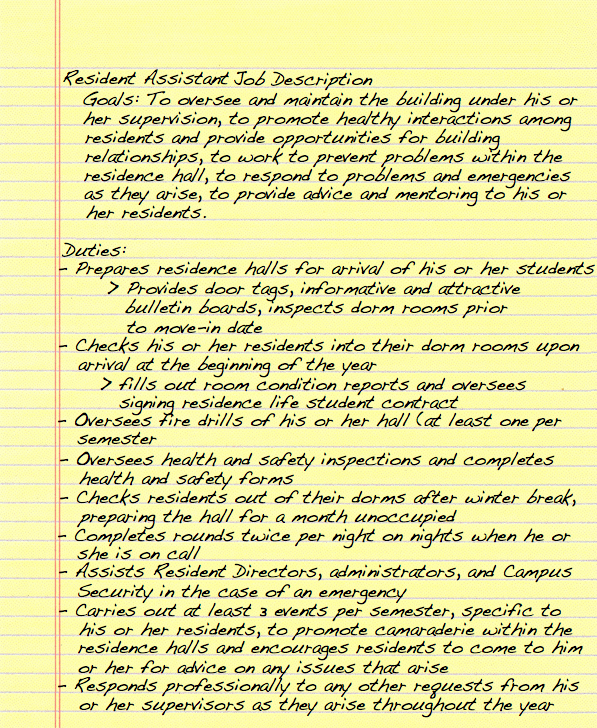 Campus-wide events, student mentoring and supervision, building upkeep, safety checks, and other routine procedures (such as student check-in and check-out) are all a few of the tasks taken on by a Residential Life department. However, it is not uncommon for many of these programs to be covered by more than one department, often particularly in the area of event-planning. It is important to begin this "defining goals" process by looking at what programs are covered both by the Residential Life department and another department (or other departments). Having served on several student panels in discussions with the Board of Trustees at my alma mater, I have deduced that often when a school is concerned about student-retention, its response is to increase funds to Student Government, Campus Life, and other committees responsible for campus events. As such, rather than resulting a solid handful of well-planned, successful events, a school ends up with a plethora of smaller, less focused, less successful events. Event planning is often a great place to start reevaluating departmental spending in a Residence Life department. If another department exists on campus which is also responsible for campus event-planning (such as a Student Government Association or Student Activities department), it is likely that "Campus Events" is not one of the Residential Life Department's "Fundamental Goals". If something covered by the Residence Life department is covered also by another department, it should be placed on the bottom of the list of important programs to keep. On the other hand, if there are programs that are largely designated to the Residence Life department (such as student mentoring, conflict resolution, building supervision, "bonding" activities within the residence halls, etc. ), these programs should be given precedent when compiling the list of departmental goals. Once the department has outlined its fundamental goals, it is important to then decide what each employee's role is, as changes in departmental practices may require several changes in his or her usual routines. If, for example, the planning and executing of large events has been eliminated from the department's list of programs, the time that employees previously dedicated to planning such events is also eliminated. When a department undergoes large changes, failing to clarify what each employee's role is under the new "plan" can result in a lot of work-related ambiguity, which ultimately leads to unfocused and ineffective work. Creating a clear description of what is expected of each member of the department makes expectations obvious to employees (and makes it obvious when that employee is not carrying out his or her job!). Once the departmental goals have been established, it is important to determine what programs and practices are needed to meet these goals. For example, if the department has decided that its focus should be placed on developing healthy relationships among residents, how does it go about accomplishing this? For each goal, members of the department should come together to brainstorm realistic ways to accomplish it (keeping in mind the resources available to them, both financial and in personnel). RAs and First-Year Mentors and Advisors with the same students should meet up prior to the arrival of their students, and should use each other as a resource when it comes to questions or concerns about any of their students. Encourage RAs to knock on residents' doors and check in, reminding residents that they are available to help with any situations that show up. 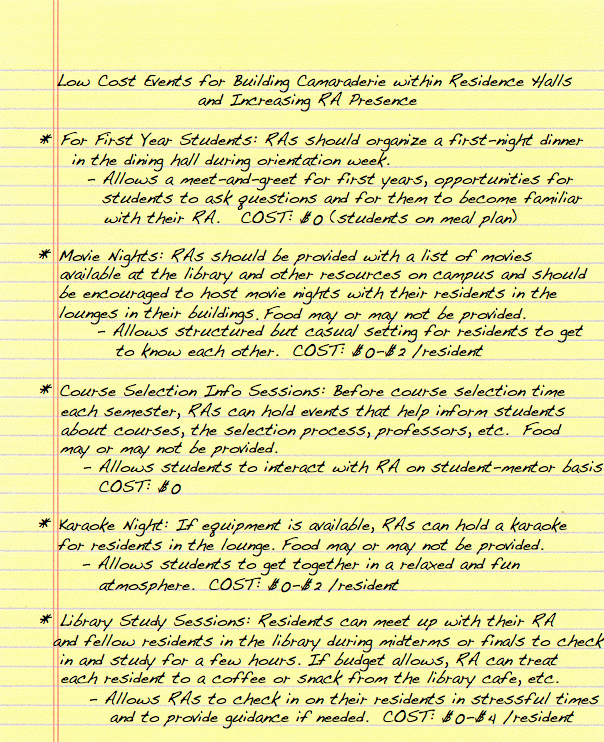 Many RAs are very busy and are sometimes absent from the dorms because of other activities. 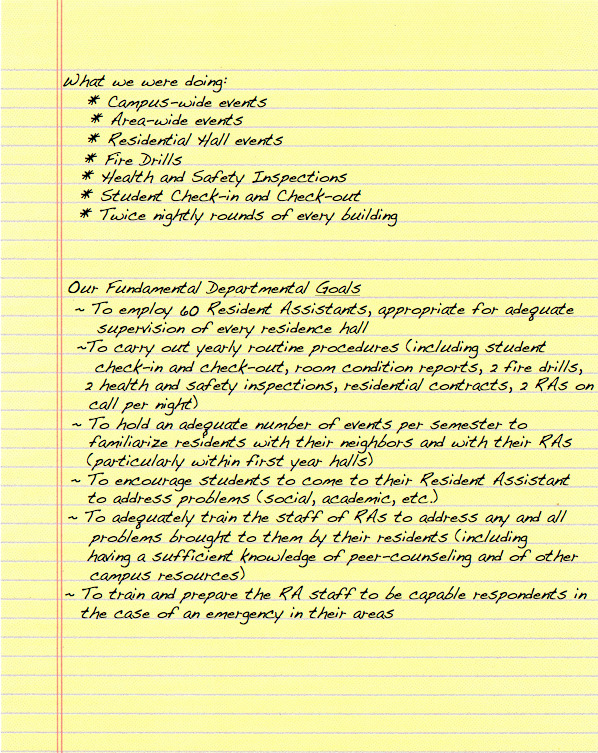 Reminding them to make a point to develop a presence within their residence halls will make a significant difference. RAs should give additional focus to the upkeep of their residence halls, including maintaining the informational bulletin boards. A hallway exhibiting disrepair gives the impression that nobody is paying attention to its upkeep, which in turn reflects the RA's concern for the well-being of the students who live there. RA involvement in other departments on campus (such as the Student Health Center, Student Activities Department, and other specific focus groups) serve as great opportunities for RAs to encourage their residents to become involved, to familiarize RAs with other campus resources, and to increase RA presence without additional costs. RAs should be encouraged to get involved with events put on by other departments if they are interested in campus event planning. Other departments will likely welcome the additional help from interested RAs. This allows for the same amount of campus event involvement if desired, while reserving funds for events that meet the more specified goals of the Residence Life department. A campus Health Center might decide it is worthwhile to provide RAs with supplied of the medicines provided for free in their office, such as Tylenol and Advil, thermometers, contraceptives, cough drops, band-aids, and informational brochures and fliers. The result is a win-win relationship: the Health Center is able to better spread their "Cover your mouth when you cough" posters and the RAs become go-to resources for basic first aid needs. The cost to the Residence Life department is minimal and the cost to the Health Center is minimal (as they likely have large reserves of these items already). Once the departmental goals have been established, and an extensive list of low-cost program options that will help meet these goals has been developed, a new budget can begin to be formed. First, it needs to be determined what the budget will cover, which will vary by institution. The budget may need to cover RA Training in the fall and winter (food, RA Manuals, supplies for presentations if applicable), Yearly Event Costs, and the RA Salaries. Let's say the budget is $90,000. To employ 60 Resident Assistants at $1,000 per year (plus a free room for the year) totals $60,000, with $30,000 remaining for training and events. If training lasts 3 days each time, coming out to 6 days total, with 3 meals a day, we need 18 meals total for 60 students. If the on campus dining hall charges $7 per meal per student, to feed 60 students for 6 days would cost $2,520 total, plus another $2,000 for supplies needed for training (printing RA Manuals, etc.) which leaves us with $25,480 for everything else. If we extract another $1,000 for the office to purchase supplies for RAs to make bulletin boards and door tags for their residents, leaving $24,480 for events, which breaks down to $408 per RA for events for their residents, which is plenty if you look at the cost of the example events. Figures 1 and 2: Below are a couple pie chart examples, comparing the portions of the funds allocated to each program. Remember, while pie charts are good and showing the part:whole relationship. this graphic does not indicate change in the size of the budget (you have to check out the captions for that. Figure 3: The bar chart below allows us to better conceptualize the changes in the amount of money (rather than in the amount of the budget) being allocated to each program AND the changes between the former and new budgets. 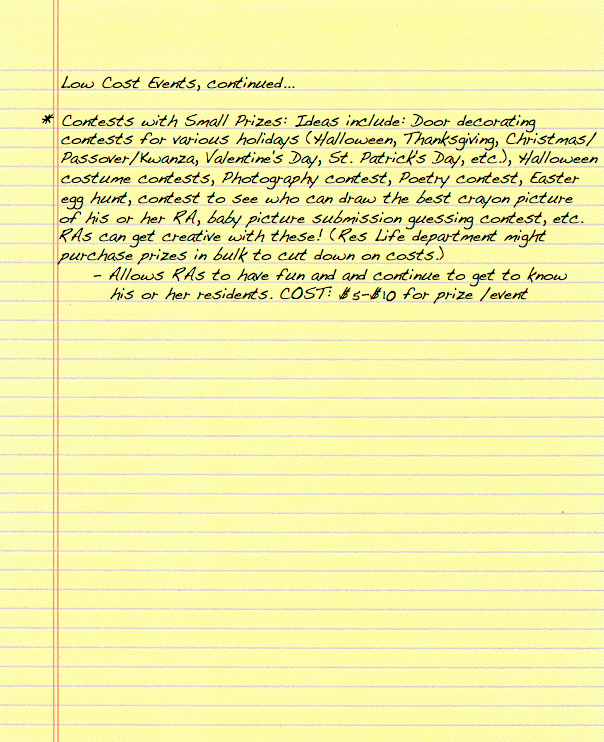 Once a new budget and organization of the department has been established (having considered the input of interested members of the department), the budget, employee roles and expectations, and overall plan should be outlined and distributed to the members of the department so that everything is clear. Having a document to refer to can make all the difference!